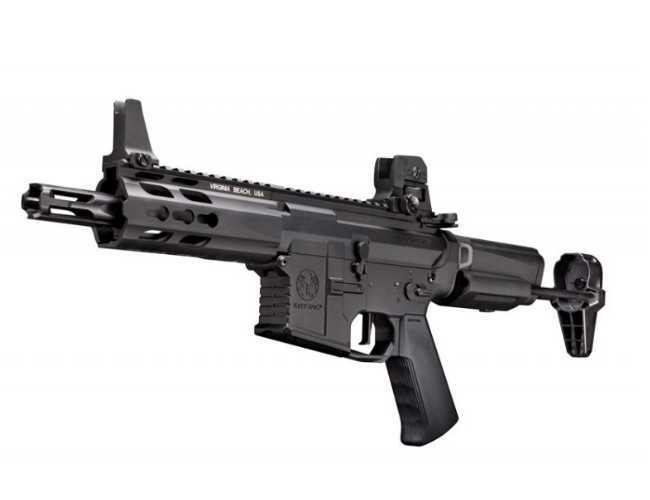 New updated and improved.The Trident PDW Airsoft rifle is a very compact rifle and is made for maximum maneuverability in close quarters combat. It is a full metal short 5.5” barrel and a 5” floating, keymod hand guard version of this powerful and reliable model. Black. The light aluminum receivers has a stamped logo and realistic matte black finish.It comes with an ambidextrous fire selector and locking bolt that gives access to the rotary hop-up system. The hop-up has 15 adjustment modes with numbered wheel for reference point. At the back of the gun is an adjustable battery stock that will give 2 battery settings-Nunchuck or lithium brick. The stock also features 2 sling swivel divots as well as a loop for slings. The PDW has a plenty of power. Easy lubrication of gearbox can be done by a small window and can double as an inspection hatch. Outer Barrel Length 13.97 cm / 5.5". Inner Barrel Length 155 mm. Inner Barrel Diameter 6.05 mm. Hand-guard / Rail Length 12.7 cm / 5." Stock Adjustable to 2 Positions. Overall Length 527 mm (20.75") - 610 mm (24"). Overall Height 180 mm (7").